The word Go also means “light“, so gomukh may refer to the light in or of the head, or lightness of the head. 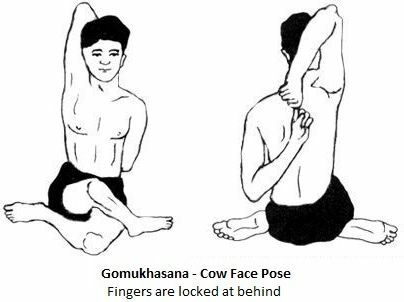 The asana gets its name because the thighs and calves of the person performing it resemble a cow’s face, wide at one end and tapering toward the other. Gomukhasana stretches several parts of the body simultaneously, including ankles, thighs, hips, chest, neck, arms and hands. Start seated with your legs extended in front of you. Bend your knees so your feet are flat on the floor. Cross your right leg underneath your left leg bringing your foot to the outside of the left hip. Your left leg moves over top, so that the thighs cross tightly and your knees are close to stacking one on top of the other, in the center of your body. Flex both feet, and position your ankles an equal distance away from the thighs to allow both of your sitting bones to meet the mat. Press the outside edges of your feet into the earth, keeping them flexed. Bring your right arm out to your side at shoulder hight, and rotate the palm up so that the shoulder balde melts down your back. Inhale and raise your right arm overhead until it is beside your ear. Keep your neck relaxed and in neutral. Exhale as you bend your right elbow, placing the palm of the hand onto your back, towards the middle of the shoulder blades. You may gently use your left hand on your right elbow to encourage the elbow to move more towards the midline. As you inhale, bring your left arm out to your side at shoulder height, rotate your palm down noticing the opposite motion of the shoulder blade slightly up. Bend your elbow, exhale and lower your arm to your side with the back of the hand on your lower back. Slide your hand across your low back until your upper arm is beside the torso, then reach your hand up the back towards the middle of your shoulder blades. If your hands touch, curl the finger to link your two hands. Keeping your spine tall, neck in neutral and relaxed, imagine reaching the elbows away from each other, while they hug towards the midline. If the head it able to touch the right arm, gently press the head back into the arm, lengthening the back of the skull. Advanced Variation – To deepen the pening in the hips, inhale as you sit taller and exhale as you hinge forward with a long spine and long neck, bowing towards the legs. Breathe for five or more long breaths. If folded forward, inhale slowly up to sitting, exhale as your release your arms and extend your legs forward. Sit on height to allow your pelvis to tilt forward, increase the natural curve in your low back, and allow your hips to open. If you are having difficulty crossing the legs tightly, place the foot of your top leg flat on the floor as in Marichyasana Pose, either in front of the shin, or beside the thigh. You may also practice the arms alone with the legs in Sukhasana (easy cross legged pose). Rotator Cuff Injury – Do not take your bottom arm behind your back, or only take your arm within the pain free range of motion. Knee Injury / Pain – Do not cross the thighs as deeply if it causes pain (follow modifications above). Low Back Pain / Tension in the Pose – Sit on the edge of a cushion to tilt pelvis forward, or decrease the depth of your arms in the pose (see modifications above). Neck pain – Avoid raising the top arm overhead, instead take both arms behind the back with elbows bent, grasping the opposite forearm. Walk your hands along the forearm towards the elbow to deepen the pose. Stretches the back of your arms, your rotator cuff, your upper back and chest muscles. Stretches your gluteus, tensor fascia latae, piriformis and other hip rotator muscles.